Hi-Viz Trousers EN ISO20471 S/Yellow XL BITSYXL Pack of 1 Proforce Hi Viz Site Trousers. EN471 and EN343 class 1. fully waterproof taped seams. Fully elasticated waist. Adjustable ankle fasteners. Size: Extra Large. 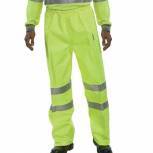 Hi-Viz Trousers EN ISO20471 S/Yellow Medium BITSYM Pack of 1 Proforce Hi Viz Site Trousers. EN471 and EN343 class 1. fully waterproof taped seams. Fully elasticated waist. Adjustable ankle fasteners. Size: Medium. Hi-Viz Trousers EN ISO20471 S/Yellow Large BITSYL Pack of 1 Proforce Hi Viz Site Trousers. EN471 and EN343 class 1. fully waterproof taped seams. Fully elasticated waist. Adjustable ankle fasteners. Size: Large.